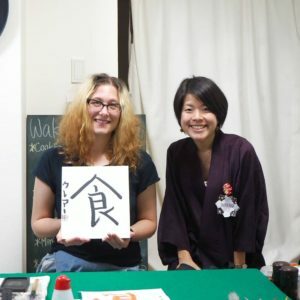 She came for the Japanese calligraphy and Tea ceremony classes! She chose the best word (for me lol). 食(Shoku) means eat;9 I always say, I LIVE TO EAT!! Then she went to the Tea ceremony on the other day. 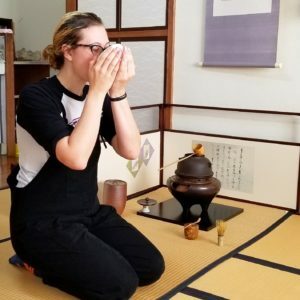 Why I don’t do Tea ceremony classes by myself? Because I don’t have much experiences for it. 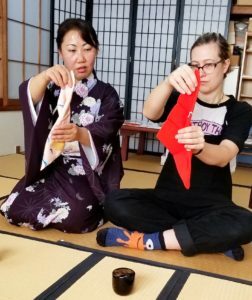 I actually wanted to learn Tea ceremony few years ago and my Calligraphy teacher who is also a master of Tea ceremony let me join her lesson as a trial. It was fun but there are soooo many things that I have to know and memorise. Like,,, how to entre, how to walk, how to bow,,, then I just gave up!! I thought it was going to very hard to be a professional in my age (also I want to gain my Calligraphy skill more). 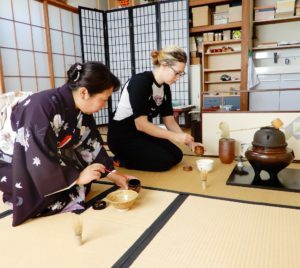 But since I know there are people who don’t know much about tea ceremony but teach it to tourists (same as calligraphy), I asked her if she could help. So at least my guests will only experience the true authentic tea ceremony. 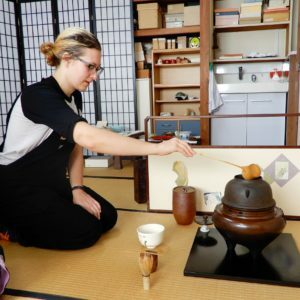 Tea ceremony, Calligraphy and many of traditional arts, it’s not something you can get in a few years. Even 10 years. That’s why that’s skill. We spend lots of time, money and more to gain our skills. 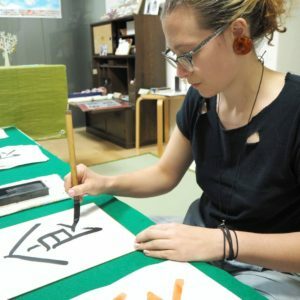 I’ve seen some of other Calligraphy classes like Wakalture. I saw their writing, they didn’t have skills but tourists didn’t know or couldn’t judge so they keep doing. Sadly even most of Japanese also don’t know. When I started Wakalture but had no guests for a while, I was frustrated seeing posts of them having many gueste lol Because I knew I could do better:P But also got to know some of tourists may not really care about it (instructor was skilled or not). They seemed happy to just try them anyway. If you’re interested in Japanese calligraphy (Shodo) and Tea ceremony, then please contact me! !